Palestinian human rights associations, including the Palestinian Prisoners’ Society, Addameer Prisoner Support and Human Rights Association, the Prisoners’ Affairs Commission and the Al-Mezan Center for human rights issued their monthly report on Israeli occupation forces’ arrests of Palestinians in May 2018. Translated by Samidoun Palestinian Prisoner Solidarity Network. Israeli occupation forces arrested 605 Palestinians from the West Bank, Gaza and Jerusalem, including 94 children and nine women. 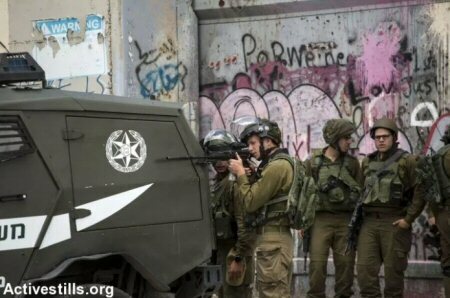 Occupation forces seized 197 Palestinians from the city of Jerusalem, 104 from Ramallah and el-Bireh, 70 from al-Khalil, 33 from Jenin, 44 from Bethleheme, 48 from Nablus, 15 from Tulkarem, 32 from Qalqilya, 5 from Tubas, 20 from Salfit, 8 from Jericho and 29 from the Gaza Strip. In addition, the Israeli occupation forces issued 83 administrative detention orders in May 2018 for the imprisonment of Palestinians without charge or trial. 36 of these were new orders and the remainder were renewals of existing detention orders. There are approximately 6000 Palestinian prisoners in Israeli jails, including 54 women and six minor girls. There are approximately 350 Palestinian children in Israeli jails and 430 Palestinians jailed without charge or trial under administrative detention. Israeli forces continued with systematic crimes in the occupied Palestinian territory (oPt) for the week of 07 – 12 June, 2018. Israeli forces continued to use force against Palestinian peaceful protestors. Four Palestinian civilians, including a child, were killed within hours of one another, in the Gaza Strip. 287 Palestinian civilians, including 43 children, 9 women, 3 journalists, and 4 paramedics, were wounded. Israeli forces continued to use lethal force against Palestinian civilians, who participated in peaceful demonstrations organized within the activities of the “Great March of Return and Breaking the Siege” in the Gaza Strip, which witnessed for the 11th week in a row peaceful demonstrations along the eastern and northern Gaza Strip border area. During the reporting period, in the Gaza Strip on Friday, the Israeli forces killed 4 civilians, including a child, and wounded 287 Palestinian civilians, including 43 children, 9 women, 3 journalists, and 4 paramedics; 8 of the wounded are in serious condition. In the West Bank, Israeli forces wounded an Israeli human rights defender and 9 Palestinian civilians, including a child; one of those wounded sustained serious wounds. Haitham Mohammed Khalil al-Jamal (15) from Rafah was hit with a bullet to the abdomen when he was in eastern Rafah. ‘Emad Nabil ‘Ali Abu Darabi (20) from Beit Lahia was hit with a bullet to the head in eastern Jabalia. The demonstrations were entirely peaceful and witnessed significant participation of women, elderlies, and children. Moreover, the fieldworkers did not witness any armed manifestations. On Friday dawn, 08 June 2018, Israeli warplanes fired fire bombs at the Return Camp in eastern Rafah, causing fire in a number of tents and the tires collected by the protesters supposed to be burnt in the afternoon. 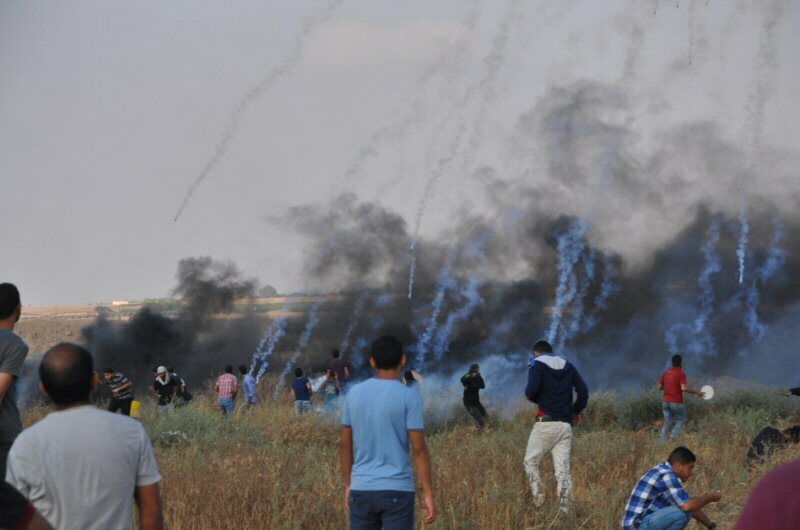 Tear gas canisters were intensively and unprecedentedly fired from the drones and by the Israeli soldiers stationed along the border fence or in the military sites. The tear gas has spared none. Ambulances, medical staff, and field medical points were deliberately and directly targeted and prevented from approaching those wounded in addition to causing injuries among them though the ambulances are 300 meters away from the border fence. On 07 June 2018, the Israeli forces closed a road used by Palestinian farmers in al-Khader village, south of Bethlehem, to reach their lands. Closure of the road which leads to thousands of dunums of agricultural lands would prevent farmers from doing their agricultural works, including plowing, planting and transferring products for marketing. On 10 June 2018, Israeli forces established metal detectors at the entrance to the lands of “Thaghret Hammad” area belonging to Ghuneim Family in al-Khader village, south of Bethlehem. Representative of Colonization and Wall Resistance Commission in Bethlehem, Hasan Breijiyah, said that the Israeli forces installed 10 containers to store goods in lands belonging to Dabash Family in the same area. Moreover, the Israeli forces affixed a notice to stop construction works in an under-construction house belonging to Majdi Marzouq ‘Issa that is almost ready for occupation and an agricultural land in al-Balou’a area in the abovementioned village under the pretext of non-licensing. As part of the Israeli settlers’ attacks against the Palestinian civilians and their property, on 11 June 2018, a group of Israeli settlers from “Yitzhar“ settlement, established in the eastern side of Burin village, south of Nablus, and under the Israeli forces’ protection attacked houses of civilians in the southern side of the village. At approximately 11:00 on Friday, 08 June 2018, hundreds of Palestinian protestors swarmed to the Return encampments established by the Supreme National Authority for the Great March of Return; 300 meters away from the border fence between Israel and the Gaza Strip, east of al-Shawkah village, east of Rafah. At the end of the prayer, the number of participants increased reaching to thousands in buses, cars and motorcycles and on foot. A number of them approached the border fence, flew kites and set fire to tires and threw stones at Israeli soldiers stationed behind the border fence. The soldiers fired live bullets and tear gas canisters at the protestors. The clashes continued until approximately 18:30. As a result, Haitham Mohammed Khalil al-Jamal (15) was killed after being hit with a live bullet to the abdomen. Haitham underwent a surgery at Gaza European Hospital in Khan Yunis, but doctors failed to rescue him. Moreover, 30 protestors, including a child, were wounded. Twenty of them were hit with live bullets and its shrapnel and 10 others were directly hit with tear gas canisters. Doctors classified the injuries of 2 civilians as serious. At approximately 13:00 on the same Friday, thousands of civilians swarmed into the demonstration encampments established by the Supreme National Authority for the Great March of Return, east of Malakah intersection, east of al-Zaytoun neighborhood in eastern Gaza Strip to participate in the eleventh consecutive Friday known as “Millions March to Jerusalem”. The activity included raising flags, chanting national slogans, setting fire to tires and flying kites. Though the demonstrations were fully peaceful, Israeli forces stationed behind the border fence between the Gaza Strip and Israel deliberately and randomly fired live and rubber bullets and tear gas canisters at them. As a result, Yusuf Salim Khalil al-Fasih (29) from al-Shati’a refugee camp was killed after being hit with a live bullet to the pelvis and transferred to al-Shifa Hospital. After hours of attempting to rescue his life, doctors announced Yusuf’s death. Moreover, 30 civilians, including 3 children, were wounded. Twenty three of them were hit with live bullets and 7 others were hit with tear gas canisters throughout their bodies. Khalid Abdul Fattah Rashid al-Yazji (24), a paramedic from Beit Hanoun volunteering for the Volunteer Nurse Team, was hit with a tear gas canister to the left hand. The wounded civilians were transferred via ambulances belonging to PRCS, Medical Services, Union of Health Work Committees and the Ministry of Health to the Indonesian and al-‘Awda Hospitals. Doctors classified the injuries of 3 civilians as serious while the other injuries between minor and moderate. At approximately 13:30, thousands of civilians swarmed to the Return encampment, east of Khuza’ah, east of Khan Yunis in the southern Gaza Strip. The participants whose number reached thousands of men, elderlies, women and children, gathered in the five demonstration areas. They were inside and outside the encampment yards, raising flags, and chanting slogans and national songs in addition to flying kites, while hundreds of them, including children and women, approached the border fence, set fire to tires and attempted to throw stones at the Israeli forces. Moreover, the protestors removed the barbed-wire fence established by the Israeli forces inside the Palestinian territories around 30-50 meters away from the main border fence. 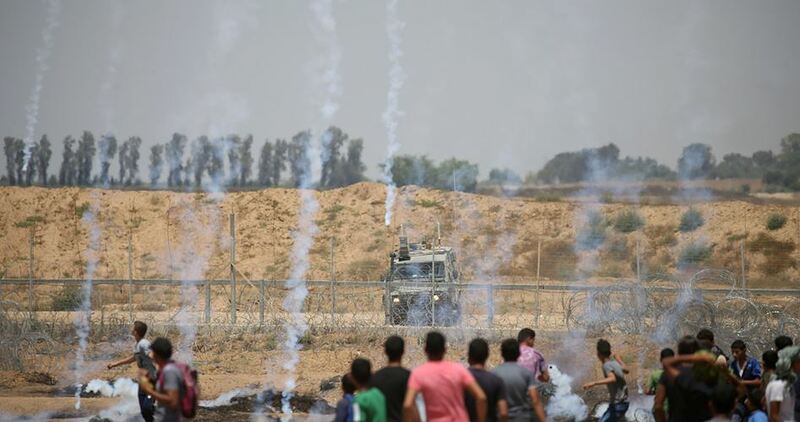 Israeli forces stationed behind hills and sand barriers and in military vehicles and its surroundings along the border fence sporadically opened fire at the protestors and fired dozens of tear gas canisters at them and at the camp yard. According to observations by PCHR’s fieldworker, an Israeli tank stationed behind sand barriers adjacent to the protestors and a drone fired tear gas canisters at the protestors and the peaceful gathering. The shooting continued until approximately 19:30 on the same day. As a result, Ziyad Jadallah Abdul Qader al-Barim (28) from Bani Suheila, east of Khan Younis was killed after being hit with a live bullet to the abdomen at approximately 17:30 during his presence within the protestors’ gathering 100-150 meters away from the border fence. Doctors announced the death of Ziyad after half an hour of his arrival at Nasser Hospital. Moreover, 110 civilians, including 12 children, 6 women, 2 journalists and 2 paramedics, were wounded; one of them was a female paramedic who was hit with a live bullet to the hand. Seventeen of them were hit with live bullets and shrapnel and 93 were hit with tear gas canisters. The wounded civilians were taken to the field hospitals and to Nasser, Gaza European, Algerian Hospitals and al-Amal Hospital belonging to PRCS. Doctors classified the injuries of 2 civilians as serious as one of them was directly hit with a tear gas canister to the head, causing fracture to the jaw and the other was hit with a live bullet to the head. Both wounded civilians were admitted to the ICU at Nasser and Gaza European hospital. The Israeli forces also targeted an ambulance belonging to PRCS with a tear gas canister that hit the windshield while it was in the south of Jaker Street around 300 meters away from the border fence. At approximately 14:30, thousands of protestors swarmed to the encampments established by the Supreme National Authority for the Great March of Return, 350 meters away from the border fence between the Gaza Strip and Israel, east of al-Buraij in the central Gaza Strip. A number of young men approached the border fence, set fire to tires and three stones at Israeli soldiers stationed behind sand barriers along the border fence. The soldiers fired live bullets and tear gas canisters at them. The clashes continued until the evening hours of the same day. As a result, 12 civilians, including 2 children, were wounded. Twenty of them were hit with live bullets and one civilian was hit with a tear gas canister to the left eye. The wounded were transferred via PRCS ambulances to al-Aqsa Hospital in Deir al-Balah. Doctors classified the injury of a civilian as serious and he was then referred to Eye Specialty Hospital in Gaza City, while they classified the other injuries between minor and moderate. At approximately 13:30 following Friday prayer on 08 June 2018, a group of Palestinian civilians moved from Kufor Qaddoum village, northeast of Qalqiliyah, to the eastern entrance to the village, which has been closed for 15 years in favor of the entrance to “Kedumim” settlement established on the village lands. The protestors chanted national slogans demanding end of occupation, condemning the U.S President Donald Trump’s decision to recognize Jerusalem as the capital of Israel and condemning the Israeli forces’ crimes against Palestinian protestors along the eastern border of the Gaza Strip within “The Great March of Return and Breaking the Siege” activities. The protestors set fire to tires and threw stones at Israeli soldiers stationed behind sand barriers. The soldiers fired rubber bullets, sound bombs and tear gas canisters at them. As a result, a 35-year-old Israeli activist who was not identified was hit with a rubber bullet to the back. At approximately 19:15 on Saturday, 09 June 2018, the Israeli forces raided Jerusalem Hotel on Nablus Street in the center of occupied Eat Jerusalem, and banned an Iftar “the evening meal with which Muslims end their daily Ramadan fast” held for journalists upon an invitation by the Chamber of Commerce in the City. Eyewitnesses said that Israeli Intelligence officers and Special Forces raided in the afternoon the hotel and surrounded it, banning anyone from entering and taking those inside out. The Israeli forces then hanged a decision preventing holding the Iftar by the Chamber of Commerce. Moreover, Israeli police officers arrested Lawyer Kamal ‘Abeidat, Head of the Chamber of Commerce, and Ra’ed Sa’adah, Jerusalem Hotel Manager, and took them to an interrogation center. The ban came after the Israeli Interior Security Minister “Gelad Ardan” signed a decision to ban the Iftar. Ardan’s office said that “the event was supposed to be a Ramadan Iftar meal, but it aimed at briefing the activities of the East Jerusalem Chamber of Commerce, which is an institution belonging to the Palestinian Authority in Jerusalem and has been closed by the Israeli government in the recent years due to the nature of its activity. On Thursday morning, 07 June 2018, the Israeli forces accompanied with the military vehicles leveled and closed an agricultural road used by the Palestinian farmers in al-Khader village, south of Bethlehem, to reach their agricultural lands. Ahmed Salah, an activist in Colonization and Wall Resistance Commission in the village, said that the Israeli vehicles closed the road leading to the thousands of dunums of agricultural lands known as “Shoshahlah; al-Sowanah; al-Hadaf; ‘Ein Qesis; and Thaher al-Zayah.” He added that the road was closed with rocks and berms to prevent farmers from reaching their lands even when using pack animals. Closing the road will not make farmers be able to do their agricultural works, including plowing, planting and transferring products for marketing. It should be mentioned that this is not the first time the Israeli forces close an agricultural road but it is part of a systematic policy to target farmers and harass them in order to leave and neglect their lands and then to confiscate the lands in favor of the settlement outposts deployed in those areas. On Sunday morning, 10 June 2018, Israeli forces established metal detectors at the entrance to the lands of “Thaghret Hammad” area in al-Khader village, south of Bethlehem. Representative of Colonization and Wall Resistance Commission in Bethlehem, Hasan Breijiyah, said that the Israeli forces established on the same day morning metal detectors at the entrance to lands of “Thaghret Hammad” area belonging to Ghuneim Family in al-Khader village, south of Bethlehem. He added that this measure means that farmers will be denied access to their lands, which will be later confiscated for settlement purposes. He also said that the Israeli forces installed 10 containers to store goods in lands belonging to Dabash Family, noting that the lands of Thaghret Hammad area have been lately exposed to a fierce campaign by the Israeli forces by closing roads and leveling lands. On Monday morning, 11 June 2018, Israeli forces accompanied with Civil Administration officers from the Construction and Organization Department moved into al-Khader village, south of Bethlehem. The Israeli forces affixed a notice to stop construction works in an under-construction house belonging to Majdi Marzouq ‘Issa that is almost ready for occupation. Ahmed Salah, an activist in Colonization and Wall Resistance Commission, said that the Israeli forces affixed another stop-work notice to an agricultural facility in al-Balou’a area in the village under the pretext of non-licensing. It should be noted that the Israeli authorities continue its policy of issuing military orders aiming at demolishing Palestinian houses in areas classified “C” in an attempt to drive the indigenous inhabitants out of their houses, seize control of them and force Palestinians to leave. At approximately 21:15 on Monday, 11 June 2018, a group of Israeli settlers from “Yitzhar“ settlement, established in the eastern side of Burin village, south of Nablus, and under the Israeli forces’ protection attacked houses of civilians in the southern side of the village. A number of the village residents upon calls via the mosques’ speakers gathered to confront the settlers and soldiers and protect their houses from the attacks. When the residents arrived at the area, the Israeli forces fired live and rubber bullets at them. As a result, 2 civilians were wounded; one was superficially wounded with a bullet under the right ear and was taken to Rafidia Hospital in Nablus; and the other was wounded with a rubber bullet to the abdomen and taken to Ben Sina Helath center in nearby Howarah village for treatment. The Palestinian Center for Human Rights (PCHR) on Wednesday called on the International Criminal Court (ICC) to open an investigation this year into Israeli crimes committed in the occupied Palestinian territories, particularly the settlement crimes and the 2014 offensive on the Gaza Strip. In its weekly report, the PCHR asked the European Union and all international bodies to boycott Israel's settlements and ban working and investing in them in accordance with their obligations under international human rights law and international humanitarian law since settlements are considered a war crime. "The international community must use all available means to enable the Palestinian people to enjoy their right to self-determination through the establishment of the Palestinian State which was recognized by the UN General Assembly with a vast majority," the report underlined. The PCHR called on the international community and UN to take all necessary measures to stop the Israeli policies aimed at creating a Jewish demographic majority in the Palestinian territories and emptying them of their original inhabitants through deportations and house demolitions in violation of international humanitarian law. The PCHR also called on the States Parties to the Rome Statute of the ICC to make every possible effort to hold Israeli war criminals accountable. It appealed to the High Contracting Parties to the Geneva Conventions to fulfill their obligations under article (1) to ensure respect for the Conventions under all circumstances, and under articles (146) and (147) to prosecute those responsible for committing grave breaches of the Geneva Conventions to ensure justice for Palestinian victims. The Center stressed the need for speeding up the reconstruction of the buildings destroyed in the 2014 war on the Gaza Strip and pressuring the Israeli authorities to lift the blockade that obstructs the free movement of goods and people and save the lives of about two million Palestinians living in the enclave.